This blog is part of a series from Castle Comfort Stairlifts that profiles the Llandudno area we serve and where our stairlift offices are plus facts about the region. Also we will give you links to stairlift information or frequently asked questions about stairlifts to guide you in making the best decision for your family. Llandudno itself, as a town, sits beside the sea, something that your relatives and you have done over the years. Many people have moved here to retire and from Victorian times it has flourished as a seaside resort. With fresh bracing sea air, a walk along the front or for the more active exploring the scenery of the Great Orme, Llandudno has delighted families for generations. If you take the strenuous climb up to the summit of the Orme via Happy Valley you will arrive up top to drink in the scenery. For the less active or less able, the tram or cable car can take you to the summit. Just as easy as a stairlift can take a Llandudno resident up the stairs. Many who lived and worked in the North West and Midlands have holidayed here as the town has a choice of two beaches. Those who like sand dunes prefer the quieter West Shore or the more popular Victorian Promenade beach on the North Shore and where the Pier is located, which incidentally is the longest pier in Wales. Many retired Cheshire folk live here. The North Shore is the setting for Venue Cymru which is the main building and landmark along the front. This is now North Wales's largest venue for concerts & has capacity for touring productions of West End shows, chart topping bands & orchestras, singers, comedians and other entertainments. 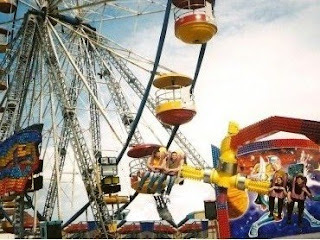 An enduring family favourite, like Castle Comfort Stairlifts, Llandudno is where you can find your candy floss & rides for the kids, as well as stunning scenery & there are extensive shopping opportunities for the adults. Here below, as with all our regional stairlift blogs, we have some of the main towns and cities in the region – along with a selection of notable residents – past and present. It’s always remarkable, how many people do not know just who comes from their own town of LLandudno. 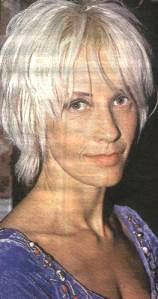 Notable people - Paula Yates, TV personality and was the wife of Bob Geldof. Neville Southall MBE, goalkeeper Born in the town and played for Port Vale, Stoke city aswell as Everton. Llandudno, ie the Great Orme would be a fabulous site for a giant external stairlift. Then all users of stairlifts on holiday could feel safer and at home whilst enjoying the best walk in North Wales. Thanks, Ken, you have just broken the world blogging record for finding our Llandudno blog within 2 hours of it going live! Your comments are appreciated and we are happy everything went well with the stair lift job. I'm delighted to find that Castle Comfort Centre now has a local office in Llandudno. So many people choose to retire to this gorgeous part of the world and obviously they will want the very best care and service when they need a stairlift.....or any other mobility aid. I shall be passing on the good news to my friends in the area. Well done, Stairlift King !! When will we have stairlifts available in hotels across Llandudno, Wales,England and the rest of the UK as a matter of course -that's the question ? Discrimination Act) legislation. It generally only applies to new buildings however, as it would be impractical and unfair if all existing buildings and businesses were made to comply and install stairlifts. Many guesthouses and hotels have multiple floors so the cost of this would be prohibitive. A voluntary code and a sensible attitude we find is generally imposed by many to accommodate disabled people - an attitude in fact they had before the legislation. North Wales Towns like Llandudno which you ask about as well as Colwyn Bay, Prestatyn, Rhoss on Sea, Conway (Conwy) and Abergele survive on the tourist industry. Many visitors of couse have special needs such as stairlifts so in general they are well catered for. 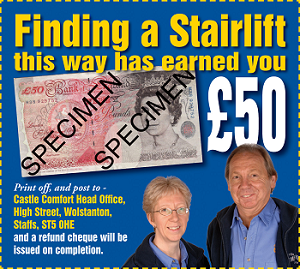 Problems only occur when people make reservations without checking first if a a lift or stairlift is in place. Up in Llandudno for a holiday - we had a stairlift done by Castle Comfort Stairlifts in Cardiff last year. Smashing. How about one to go to the summit of the Orme? - we went up on the tram but couldn't make the last bit righ to the top! Went here at Easter. Lovely walk along the front. It was a bit blustery recently though! When the weather isn't the best I take refuge in a nice hotel - with it's own lift to spare me walking up the stairs to my sea view room at the top!